Whether it's for a family gathering, a work party, or a cookie swap with friends, this time of year there always seems to be a reason to eat cookies. 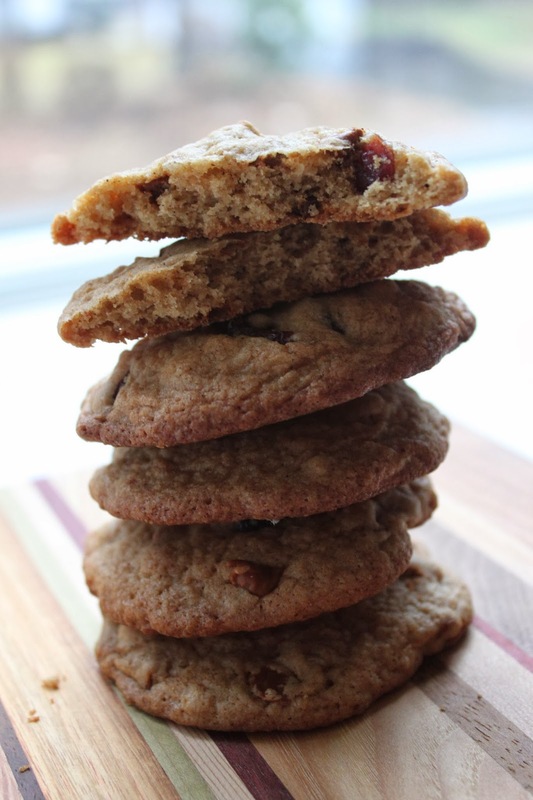 These cranberry, oatmeal, cinnamon chip cookies are just a simple variation on another couple cookie recipes I've shared on the blog before. This recipe involves the same base cookie dough recipe as my pecan, cranberry, cinnamon chip cookies and these oatmeal, butterscotch, chocolate chip cookies. The main thing I changed this time around was just the add-ins. It's almost too simple to share on the blog, but we enjoyed this ingredient combination so much that I decided it was blog worthy! Preheat oven to 350 degrees. Melt butter, and let cool slightly. Combine the two sugars in a large mixing bowl with a whisk, and once the butter is cooled slightly, whisk in the butter with the sugars. Whisk in the eggs and vanilla. In a medium bowl, combine the flours, salt, baking soda, and cinnamon. Add the dry ingredients to the wet ingredients, and mix until just combined. Stir in the oats, cranberries, and cinnamon chips. Line baking sheets with parchment paper, and drop cookie dough by the tablespoonful on baking sheet. Bake for 10 to 12 minutes or until outside edges of cookies are lightly browned. Remove from oven and let cool for a couple minutes before removing to cooling rack to cool completely. Once completely cooled, store cookies in an airtight container. Makes approximately 2 dozen cookies. What I love about these cookies (and the other cookies made with the same base dough recipe) is 1) how simple they are (you don't even need a mixer), 2) how full of flavor they are, and 3) how soft and chewy they are. There is just a very, very slight crisp to the outside edges of these cookies, but the overall texture of these is definitely chewy. It's my favorite kind of cookie! I think these would make a great addition to your holiday cookie swap or dessert table over the holidays. The cranberries and cinnamon are such perfect flavors for this time of year.